A teenage boy was stabbed by a terrorist Saturday in the Jerusalem neighborhood of Ramot. Police are hunting the attacker. A 17-year-old boy was stabbed on Saturday afternoon by a terrorist in Jerusalem's Ramot neighborhood. A neighborhood doctor and medics from the Magen David Adom emergency rescue service treated the youth at the scene before rushing him to Hadassah Ein Kerem Medical Center in the capital city. The youth was stabbed twice, in the stomach and back. He is currently sedated and is on a respirator, unable to breathe on his own. Police have launched a manhunt for the terrorist. A dragnet has been thrown around the area and a helicopter is scanning the city. 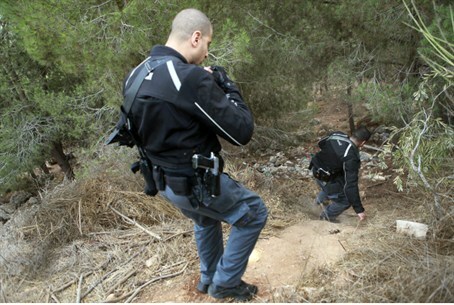 Tzion Regional Commander Chaim Blumenfeld said the terrorist fled across the nearby riverbed, towards the village of Beit Iksa. Blumenfeld said police spoke with eyewitnesses and gathered evidence at the scene of the attack. Last week the IDF's Kfir Brigade foiled an attempted stabbing attack at the Gush Etzion junction by a young Palestinian Authority Arab woman. The would-be stabber raced towards the bus stop, pulling out a knife and shouted, "Allahu Akbar" (G-d is Great) and "Death to the Jews!" One of the soldiers guarding the intersection spotted the woman, pointed his gun at her and shouted in Arabic at her to halt, prompting the would-be murderer to throw down her knife and lay down on the ground. No one was injured in the incident, which came the day after 477 PA Arab terrorists were freed in exchange for the release of IDF soldier Gilad Shalit by the Hamas terrorist rulers of Gaza. Shalit, who was held hostage for more than five years, has since returned home with his parents.